Your web application cloud hosting servers can scale automatically depending on the load. No more losing sleep over website going down during high traffic period. Also, you need not pre-purchase resources that you don’t use! You have the liberty to choose your web server engine, database engine, caching engine along with programming language from any of the 85+ support stacks. Click here to view the complete list along with versions. No longer pay for resources that you do not use but only pay for what you use. Automatic cloud services scaling ensures that your environment has enough resources to handle the load & it is scaled down when not required – this reduces your cost significantly (up to 80%). You can now install optimised environments for WordPress, Magento, Drupal, OpenCMS, Joomla, etc. with just one click. You can also deploy highly available MySQL, MariaDB, MongoDB clusters – no longer worry about complex setup & configuration. Deploy your web application directly from GIT or SVN server, custom zip file or FTP. You will be up & running very fast with control of all major config files like php.ini, my.conf, httpd.conf, nginx.conf, etc. along with SSH access. Managed Docker and Kubernetes web hosting with full compatibility to cloud-native ecosystem. Deploy your containerised applications to Docker Swarm or Kubernetes clusters benefiting from automatic cloud scaling and pay-per-use pricing approach. Turnkey Scalable Cloud Hosting With One Click Installation Of Several Applications & Tools! Pay Only For What You Use – No Surprise Billing! Below are the most frequently asked questions on elastic cloud hosting that you may have. Contact us if you cannot find an answer to your question here. Your first 1GB (SSD) storage per environment is free. Any usage above that is charged at $0.412/GB per month ($0.000565/GB per hour). The filesystem is persistent & RAID protected so everything you write there is safe, survives a reboot & disk failure as well. Internal traffic between cloud servers within your environment is always free. The first 1GB of Internet traffic every hour (approx. 730GB/month) is also free! Any usage above that is charged at $0.01 – $0.033 per GB (depending on volume). By default, each request is proxied via the Jelastic shared resolver. For production hosting we recommend to use a public IP so traffic is routed to your environment without any potential bottleneck. Also required for custom SSL certificates. Public IP is $0.005 per hour. Your public IP is static, so it remains the same even when restarting your web application hosting environment. A cloudlet is a composite billing unit comprised of 128MB RAM and 400 MHz CPU. Each Jelastic server has multiple cloudlets assigned to it, e.g. 8 cloudlets would give you 1GB RAM and 3.2GHz CPU power. The number of cloudlets assigned to your servers at any one time varies based on the resource demands of your web application. How do I know my cloudlet usage? You can view real-time cloudlet consumption in the dashboard alongside your environment, and each individual server within it. The dashboard also shows real-time graphs of CPU, RAM, network, and disk space consumption for each hosting server within your Jelastic environments. You’ll be surprised how little resources you actually use to run your web application. How many cloudlets do I need? That’s exactly the point – you can’t know this in advance. That’s why buying resource allocations is a bad idea, and why it’s much better to pay for your actual resource usage instead – by using our Jelastic PaaS hosting (so you don’t need to predict the future!). The best way to see how much resources your application actually needs is to try it on our cloud platform. You can do it right now using our 14-day free trial. How do I control my budget? You can set a maximum scaling limit for each server in your environment. This limits the maximum amount of resources your application can use (but it may run slowly or crash if there’s not enough – just like any other server), and hence also limits your costs. How can we deploy & manage our applications? Jelastic has full integration with git and svn, including support for git submodules and automated deployment (you can define the deployment schedule). You can upload web applications manually via the deployment manager in your Jelastic Dashboard. These files can be in zip, war or ear format and can be deployed to any new and existing environments you have. You can connect to Jelastic using FTP / FTP-SSL (FTPS), but this feature is only available on paid accounts with the public IP feature enabled. You can access your nodes through SSH to deploy or make changes in your environment. 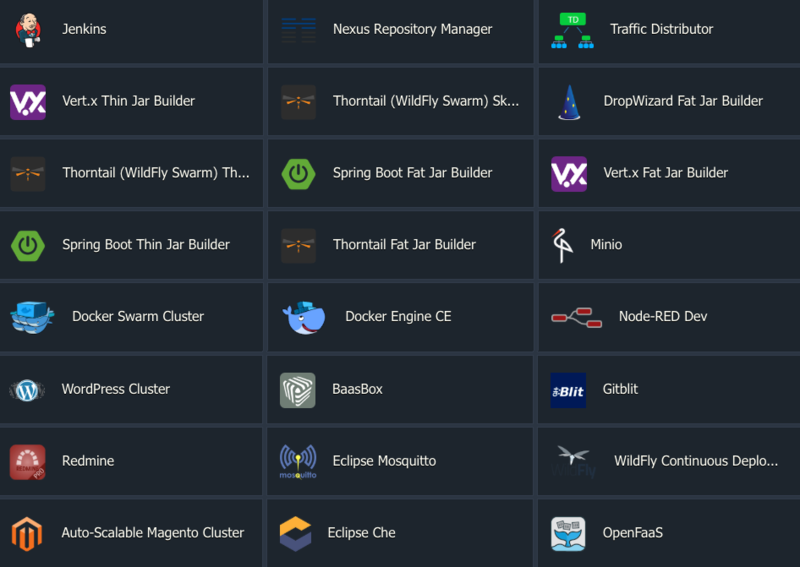 The Jelastic dashboard also provides you with full access to edit major service configuration files (e.g. server.xml, php.ini, my.cnf, httpd.conf) right from your browser. Which control panel do you offer? Jelastic includes a highly innovative control panel which allows you to create an environment, and deploy your own multiple server infrastructure in just a few clicks. There’s no control panel with the same features already out there, so this is bespoke. Which Java application servers and JDK versions do you support? We support Java (Tomcat, Jetty) and JavaEE (TomEE, Glassfish, WildFly) with JDK 6, JDK 7, and JDK 8. Which PHP application servers and versions do you support? We support both SQL (MySQL, MariaDB, PostgreSQL) and NoSQL (MongoDB, CouchDB, Cassandra, Redis) database servers. We also support graph databases such as Neo4j, and OrientDB. Yes, you can enable and deploy a fully configurable Nginx load-balancer easily via the dashboard in just two clicks! Yes, we support both Memcached (application cache and session replication), and the Nginx load-balancer can be enabled as a reverse proxy server with caching capabilities. What are other additional features available? Yes, we have full support for cron. You can easily edit your crontab using the Jelastic Dashboard, or via SSH. Can I edit the server configuration files? You have full access to edit configuration files for all of your application servers. Our support team will be glad to advise you if you need any assistance with tuning these files. What if I want to use software not supported by Jelastic? You can add an Elastic VPS to your Jelastic environment (paid accounts only). This provides a plain, CentOS Enterprise Linux server with full root SSH access for you to install and run any software you need. Elastic VPS resource usage is charged in exactly the same way (cloudlets) as the other Jelastic PaaS servers. Please note that the Elastic VPS is a completely self-managed server and it is your responsibility to maintain and secure the server. The concept behind the Jelastic PaaS is to free you from the headaches of server administration, so if there is a critical feature or function missing we would love to hear from you so we can consider adding this functionality to Jelastic in the future. Can I use SSL certificates with Jelastic? Yes, you can install your own SSL certificate on Jelastic. We recommend buying an SSL certificate from Layershift for Jelastic as we can install and manage this for you free of charge. Alternatively, you can buy an SSL certificate from your preferred vendor and install this yourself via our Jelastic dashboard. You will need to enable a public IP address on your load-balancer or web/application server to use an SSL certificate. Can I share access to my environment with my developer? Yes! You can share selected environments with your colleagues or a third-party developer, and optionally give them permission to create new environments on your account. Auto-scalable cloud web application hosting allows fast time to market, simplified deployment and reduced TCO. You will be able to run Java, PHP, Python, Node.js, Ruby, Golang and Docker-based applications using a rich variety of the most popular SQL and NoSQL databases, application servers, load balancers, cache servers and storage containers out-of-the-box. Developers can deploy and run different applications with no code changes and zero lock-in. The deployment can be easily performed using GIT/SVN with automatic updates, archives (zip, war, ear) right from the dev panel or via integrated plugins like Maven, Eclipse, NetBeans, IntelliJ IDEA. Scalable hosting has a unique approach of cloud scalability allowing granular resources to be allocated based on the load level. This ensures application availability and, at the same time, high efficiency by paying only for really consumed services and storage resources. We provide developers portal with user-friendly UI that includes an intuitive application topology wizard, deployment manager, access to log and config files, collaboration tools and marketplace with prepackaged applications. SSH Gateway is available for access to the containers. Lastly, there is no need to reserve resources, as our scalable cloud hosting platform allocates them automatically based on the current load and using a small scaling step (128 MB of RAM and 400 MHz of CPU). As a result, the user is charged only for really consumed storage and resources but not for the limits. There is also a free trial to get started with our scalable cloud services.